← What Is Really Happening in Syria? Never let a crisis go to waste – especially if demographics for the next election can be manipulated. The following pictures from Hurricane Irene depict the extensive flooding from this storm. The first picture is from Hurricane Irene but more disaster pictures can be viewed here. The second picture is from Minot, ND followed by Omaha, NE and then the Fort Calhoun Nuclear Station. What are the differences between Hurricane Irene and the Missouri River Basin flooding? As Texas found out this year, a red state devastated by fires will suffer retribution at the hands of this administration. Federal disaster relief was delayed several months. The areas that would have been impacted by Irene were blue states which have come to expect and demand the government’s assistance. 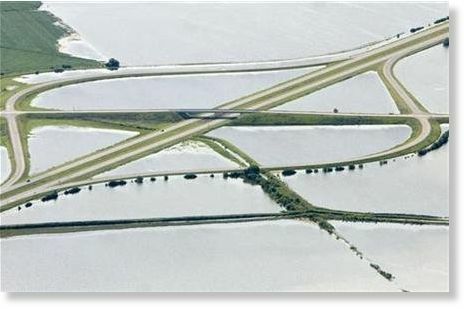 The Missouri River Basin flooding was caused by the Army Corps of Engineers in order to minimize the effects of flooding on the Mississippi River this spring and incompetence. Holding an act of God responsible for the effects of a hurricane is the hallmark of this president’s administration of blame. It also allows the president to accept the praise for providing for the people’s wants and needs. The effects of Hurricane Irene are minimal compared to the Missouri River Basin flood. The flooding from Irene will recede in a few days and the government will once again throw money at a “crisis” based on votes, not need. While the Midwest was flooded for months and the impact will be felt in our food supply through next year, both the media and the government downplayed a real crisis. While the Missouri River Flooding did not offer a photo op for the president, Obama wasted no time to use Hurricane Irene for a photo opportunity. Voting does have consequences and this administration will never let a crisis like a hurricane or earthquake go to waste. Especially when it diverts our attention and allows money to be spent to reward past and future votes. This entry was posted in Editorial, Voter issues and tagged Hurricane Irene, Missouri River flooding, NC Renegade. Bookmark the permalink.